Two days after Christmas, on Thursday morning, December 27, I spoke at the dedication ceremony of the Mount Pleasant Cemetery Reclamation. The reclamation of the pioneer cemetery in rural Panola County is the tenth such project completed by Elvy J. Adams. 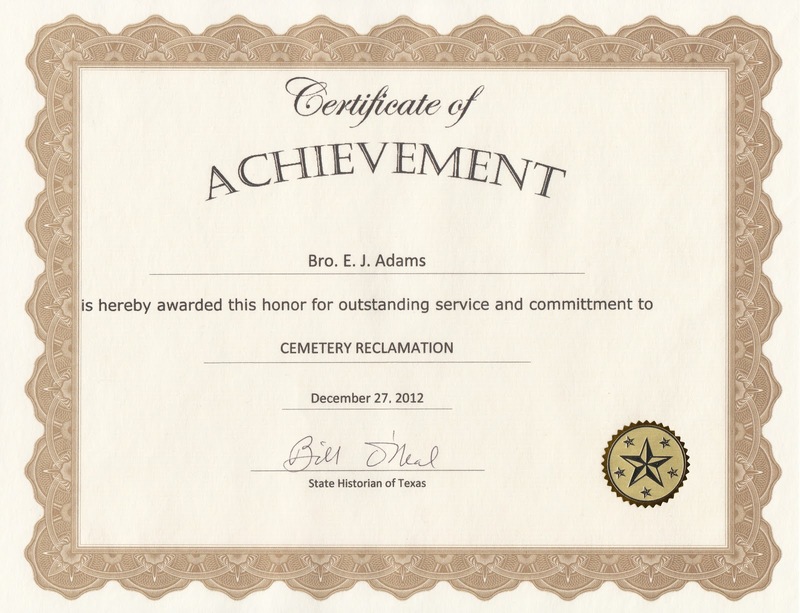 Since his retirement as a minister in 2005, Adams has dedicated himself to reclaiming forgotten, overgrown cemeteries. Nine of the cemeteries have been in Panola County, the other in Shelby County. Elvy J. Adams is a native of Panola County. Born and raised on a farm near Beckville, when he was 16 his mother permitted him to join the United States Air Force. Although he was underage, there was no birth certificate, and in 1948 the teenager launched a 22-year career in the USAF. Following combat in Korea, he began to drink heavily. But his life changed in 1953. While at home on leave Adams met a pretty young woman in Carthage. Elvy and Erma Fae Adams will soon celebrate their 60th wedding anniversary. They are the parents of five daughters, and they have 14 grandchildren and 17 great-grandchildren. And early in their marriage, Erma led her husband to religion. While stationed at Clark Air Force Base in the Philippines, Sergeant Adams was the NCO supervisor of 750 civilian guards. In 1954 he built a church for Filipinos a short distance outside the base. Although uncredentialed as a minister, he continued to build churches in the area. While in the Air Force he completed a high school diploma and pursued a college degree. Adams was credentialed by the Assemblies of God and continued to found and erect churches. After retiring as a master sergeant in 1970, Adams entered fulltime pastoral work. He organized one congregation after another, and supervised the construction of numerous churches. After retiring from pastoral work in 2005, he found another challenge in reclaiming cemeteries. His first project was at Sugar Hill, north of Beckville, where his great-grandfather (a descendant of President John Adams), grandparents, and other relatives are buried. After a cemetery is recommended to him, Adams approaches the county commissioner in whose precinct the old graveyard is located, and obtains the use of needed equipment. The county probation office provides workers who owe community service hours. The county surveyor and an archaeology professor from Stephen F. Austin State University develop information about each cemetery. Landowners grant various permissions to Adams with a handshake, and other citizens readily cooperate with the affable and persuasive former pastor. Brother Adams asked me to speak at the dedication of his ninth project, the long-neglected cemetery at Grand Bluff, an early-day ferry crossing on the Sabine River in northern Panola County. A few years earlier I had visited the overgrown graveyard while preparing Carthage, an Arcadia book. In November 2012 I returned to the cemetery in preparation for the dedication, and I was astounded at the transformation. The property was cleared, fencing was repaired, broken tombstones were again intact, and well over 100 small crosses marked rows of graves that had been rediscovered. On the morning of November 13 a large crowd assembled at Grand Bluff Cemetery. Brother Adams presided, introducing various individuals who had lent assistance, and briefly recounting the course of his most recent project. There was a prayer of sanctification, and I offered historical perspectives. That evening Brother Adams called me, and I told him how impressed I was with his work and that it was a privilege to participate. His enthusiasm is infectious, and he informed me that the State Historian now was a member of his team! A month later he contacted me to let me know that the State Historian was needed at the dedication of Mount Pleasant Cemetery, between Deadwood and Galloway in eastern Panola County. Although the Mount Pleasant Cemetery was a small family graveyard, a substantial crowd - almost all of whom were descendants of those lying at rest - gathered on December 27. Brother Adams presided, and he asked Sheriff-elect Ron Clinton to introduce me. I was privileged to be introduced by Ron, who is a former student of mine and who has forged an impressive career in law enforcement. Ortigo stands at left with her trumpet. Following my remarks I announced to the audience that the Mount Pleasant Cemetery was E.J. Adams's tenth reclamation project, and I commemorated his efforts by presenting him with a Certificate of Appreciation from the State Historian of Texas. Rev. Mervin Scott, pastor of the nearby Deadwood United Methodist Church, consecrated the cemetery, and Destiny Ortigo - a teenaged descendant of the cemetery's families - concluded the event by playing "Taps" on her trumpet. As we departed the cemetery, Brother Adams mentioned to me that two more reclamation projects would be ready for dedication early in 2013. During the years following the Civil War, the beneficial possibilities of collective action were sought by groups such as industrial workers, through labor unions, and farmers, through the Grange and the Farmers Alliance of the South. Stockmen quickly recognized the need to organize themselves against cattle thieves and to coordinate roundups and other ranching practices. The Cattle Theft Association, founded in 1865, was the first of several New Mexico associations formed to battle rustlers. The Colorado Cattle Growers Association was organized in 1884 and counted among its members a young rancher from New York named Theodore Roosevelt. The Wyoming Stock Growers Association exercised enormous political power, and when the Wyoming Territorial Capitol opened in 1888, there was an office suite for the WSGA. There were more ranches on the vast ranges of Texas than in any state or territory, and livestock theft was rampant. On February 15, 1877, 40 ranchers met in Graham, seat of Young County. Legend suggests that the meeting was held beneath a large oak tree, but it is more likely that the ranchers gathered inside the year-old courthouse on a chill February Thursday. C.C. Slaughter had helped to organize the meeting, and Burk Burnett was among the prominent ranchers who attended. The ranchers formed the Stock-Raisers' Association of Northwest Texas, intending to counter rustlers with field inspectors and to organize roundup districts for spring work. Scornful of the relatively mild term "rustlers," association members preferred "damn cattle thieves." As the organization grew in effectiveness and membership, the name was changed to the Cattle Raisers Association of Texas, then to the Texas and Southwestern Cattle Raisers Association. Today the SWCRA, with 15,000 members, is the world's largest organization of its kind. On a recent visit to Graham I took another look at the mural and the site of the oak tree, and I toured the Old Post Office Museum on the large town square. In Fort Worth the Texas and Southwestern Cattle Raisers Foundation maintains its headquarters at 1301 West 7th Street. Outside stands a superb statuary of cowboy and cattle, and inside is the Waggoner Library, an excellent research facility. The headquarters building long featured the Cattle Raisers Museum, but it has been upgraded, modernized, and moved to the city's museum district, just opposite the National Cowgirl Museum and Hall of Fame. in this issue (Oct. 1987). On an evening in December 1949 we piled into the family car at 1717 Woodlawn in Corsicana. My dad was behind the wheel and Mother sat beside him. My sister and I were in the back. I was seven going on eight, and Judy was two years younger. 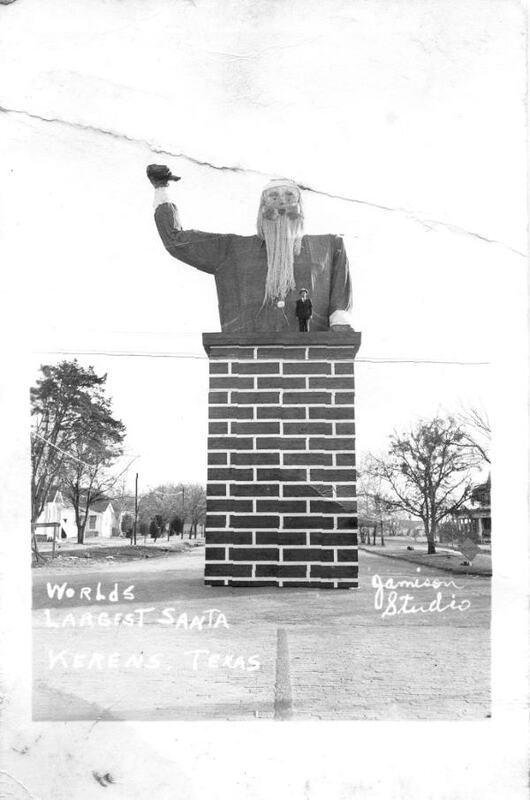 We were excited, because we were driving to Kerens to see the "World's Largest Santa Claus." Kerens is located 15 miles east of Corsicana. 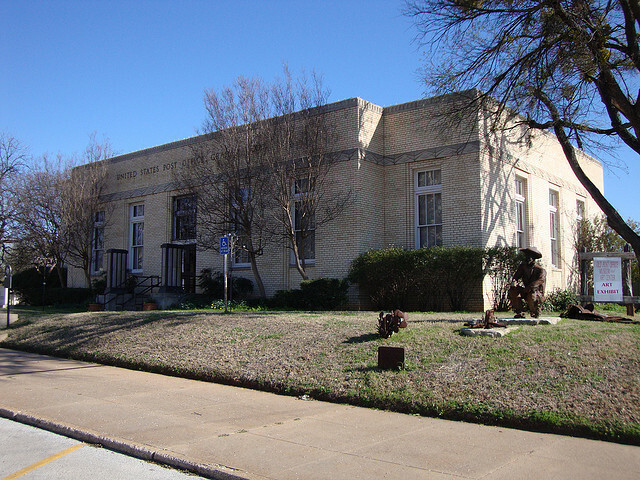 The town was founded in 1881 when the St. Louis Southwestern Railway built east to west through Navarro County. By the 1940s the population exceeded 1,500 and the commercial district stretched for two and a half blocks south of the railroad tracks along Colbert Avenue. The business buildings were brick, and a block to the east was an impressive brick cotton gin. But by 1949 business was falling off, as shoppers drove to Corsicana, or, sometimes, to Dallas. Howell Brister, president of the Kerens Chamber of Commerce, devised a plan to stimulate local shopping during the all-important Christmas season. He proposed that the community build and display the "World's Largest Santa Claus." Local welders and the high school ag students fashioned a frame out of $68 worth of iron drill casing. Huge boots were formed by a concrete worker. Women employed at a Kerens garment factory stitched 168 yards of red oil cloth. The dimensions of two heavyset men, Ottis Spurlock and Hardy Mayo, were multiplied by seven to design a pattern. Art students from Baylor University put together a papier-mâché head, while seven-foot lengths of rope were unraveled to make Santa's beard. When assembled, he stood 49 feet tall. After arriving in Kerens, we turned right on Colbert Avenue, crossed over the railroad tracks, and fell in behind a long line of cars. We drove slowly past the business district, which was gaily decorated for Christmas shoppers. At the south end of the street stood a massive Santa Claus! For a seven-year-old it was an unforgettable site, one that remains vivid more tan six decades later. Unfortunately, the novelty soon wore off of Super Santa. After two years in Kerens, the giant figure was sold to R.L. Thornton of Dallas. Santa was converted into a cowboy, and made his debut as "Big Tex" in 1952 at the State Fair of Texas. But every October when I visited the State Fair, I saw Big Tex and thought of the "World's Largest Santa Claus." On Tuesday, December 11, my most recent book was released. 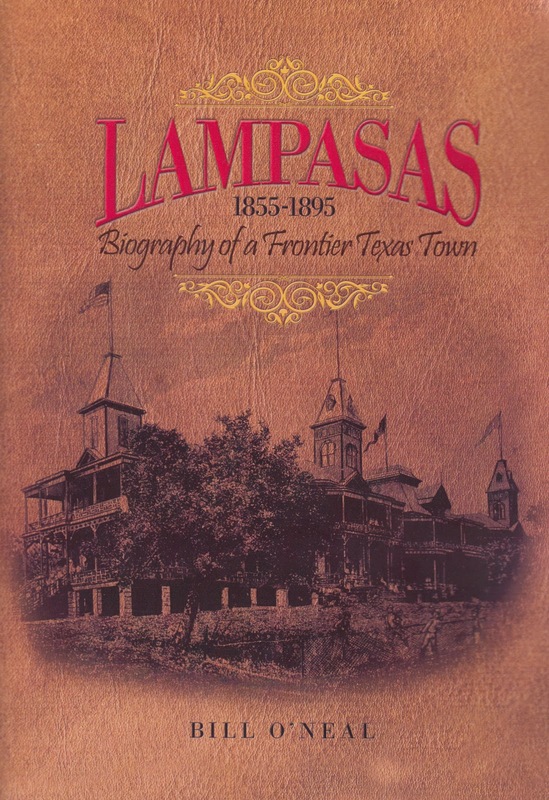 Lampasas, 1855-1895: Biography of a Frontier Texas Town is the third in a series of studies of the urban frontier. I've long been drawn to the subject of the urban frontier, to the activities of urban pioneers, and in 1995 I enjoyed writing a coffee table book on Western ghost towns for Publications International of Chicago. After reading the brilliant study by Dr. Donald L. Miller, City of the Century, The Epic of Chicago and the making of America, I determined to apply his approach to the formative period of a frontier community. In 2006 Eakin Press published Cheyenne, 1867-1903: A Biography of the "Magic City" of the Plains, a study of the formative period of this important Western town. Almost immediately I had the opportunity to explore the formative years of Caldwell, Kansas, the last railhead of the Chisholm Trail. Border Queen Caldwell: Toughest Town on the Chisholm Trail was published in 2008. Eakin Press urged me to write a third book on a frontier town, to complete a trilogy. I knew that for a third book I wanted to examine the frontier past of a Texas town, and soon I realized that the subject should be Lampasas. Lampasas is my mother's home town, and I have three generations of family roots there. My first three years as a teacher were spent in Lampasas, as an 8th-grade Language Arts instructor and athletics coach. I've been in and out of Lampasas all of my life, visiting relatives and friends. I've written about Lampasas in other books, including a biography of rancher-gunfighter-trail driver Pink Higgins titled The Bloody Legacy of Pink Higgins: A Half Century of Violence in Texas. The 19th century experience of Lampasas was rich and colorful. For nearly three decades, the settlers of Lampasas were challenged by frontier hardships and dangers. The isolated Hill Country community was founded in the 1850s amid bubbling mineral springs. During the summer “watering seasons,” hundreds of Texans made their way through the wilderness to “take the waters” at Lampasas Springs. Most of these summer visitors camped for weeks in shady groves beside the springs - enjoying such simple recreations as visiting, singing, communal meals, and preaching services - while children swam and played in large gangs. Lampasas merchants learned to rely upon an annual upsurge in business, as the population doubled and sometimes tripled each summer. During the town’s formative decades, Lampasans endured Comanche raids, murderous saloon shootouts, a vicious blood feud, stock theft, lynchings, stagecoach robberies, and conflict between cattlemen and sheepherders. Trail drives paused at Lampasas Springs, and area drovers herded cattle up the famous trails as the cowboy culture permeated Lampasas. Trail boss Pink Higgins became a gunfighter of the front rank, the Horrell brothers were notorious cattle rustlers, and the Horrells triggered a saloon fight unique in the annals of frontier violence. The long frontier era ended when railroad tracks reached Lampasas in 1882. The magnificent Park Hotel was built as the centerpiece of a 200-acre park, which for a few years became the leading resort of Texas. Statewide political and denominational conventions were held at the “Saratoga of the South.” The Texas Bankers Association organized at the Park Hotel, and the Daughters of the Republic of Texas adopted their name during a Lampasas meeting. The Texas State Guard, forerunner of the National Guard, held its first two statewide encampments on the spacious grounds of the Park Hotel. The urban pioneers of frontier Lampasas enjoyed a Victorian heyday through the glamour of the Saratoga of the South. and key to the city to Bill. The Lampasas chapter of the Daughters of the Republic of Texas (the DRT adopted its name during an 1891 organizational meeting in Lampasas) arranged and advertised the introductory event for the new book. A Tuesday evening meeting was held in the Hostess House, an historic building owned and maintained by the DRT at Hancock Springs, the largest of the seven Lampasas mineral springs. A large crowd gathered, but before I was introduced to deliver my program, DRT chapter president Carol Northington Wright summoned Mayor Jerry Grayson to the speaker's stand. Mayor Grayson presented me with a certificate of appreciation - and a key to the city of Lampasas. Then County Judge Wayne Boultinghouse, on behalf of the Commissioners' Court, read a proclamation declaring December 11 Bill O'Neal Day in Lampasas. These honors filled me with heartfelt gratitude, and I wished that my late mother, Jessie Standard O'Neal, could have witnessed the awards. Following my program about frontier Lampasas, everyone was invited to share refreshments, visit, and purchase copies of the new book. I announced that for each copy sold, I would donate $5 to the DRT chapter.As the line formed, two DRT ladies, Diane Davis and my sister, Judy O'Neal Smith, arranged themselves to help with sales. With their efficient assistance, I signed books non-stop for nearly two hours. Many people bought multiple copies as Christmas gifts, and I had a delightful time renewing old acquaintances. To accommodate those who could not come on Tuesday night, the Keystone Square Museum was opened for another signing the next morning, from nine until noon. After the enthusiastic turnout of Tuesday evening, we thought that Wednesday morning would be slow. But again we were visited by a large crowd. The response to the new book was most gratifying, and I'm still glowing because of the warm and hospitable reception of the State Historian. On Thursday, December 6, I presented a program on Pearl Harbor over KGAS Radio Station in Carthage. The half-hour program, Panola Pride, airs five days a week. Jerry Hanszen, owner-manager of KGAS, maintains a keen interest in local, Texas, and U.S. history, and he has kindly invited me to present programs on numerous occasions in the past. For the Pearl Harbor program, I was hosted by Judy McNatt, a longtime KGAS employee. While relating the events of Pearl Harbor, I included the exploits of such Texans as Dorie Miller of Waco. 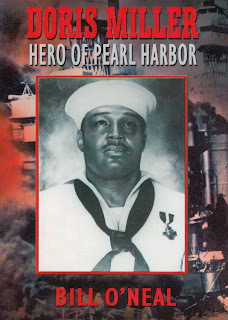 A mess attendant aboard the battleship West Virginia, Miller's heroism aboard the sinking vessel rendered him the first African-American sailor to earn the Navy Cross. The Navy's highest award for valor was presented to him by another Texan, Admiral Chester Nimitz of Fredericksburg. Chuck Otterman, whose daughters were enrolled in my history classes in past years, was a young gunner's mate aboard U.S.S. Arizona on December 7, 1941. When the battleship was blown apart by an explosion, Otterman and a shipmate swam to nearby Ford Island, where they later obtained a motor launch and returned to pick up survivors. Following the broadcast, I happily recorded a newscast about my recent trip to Texarkana and subsequent awards. This news story also was placed on the KGAS website. Shortly afterward I was interviewed by the Panola Watchman about this same story, and the newspaper account and a photo were placed on the front page. 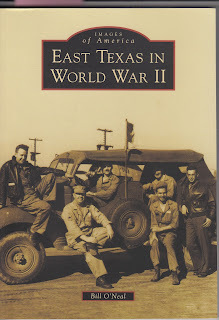 The local media are helping to spread the word about the State Historian of Texas. Late on Thursday afternoon, December 6, I was visited at my home office by Brooke Hanszen Paddie and her two sons, Topher and Noah. Brooke is the daughter of Jerry and Wanda Hanszen and the wife of Chris Paddie, former mayor of Marshall and the recent winner of election to the Texas House of Representatives. The oldest son of Brooke and Chris, eleven-year-old Topher is a middle school student in Marshall, and he has been assigned to prepare a project for an upcoming History Fair. Topher is working on a project about the Texas Governor's Mansion, and his mother scheduled an interview with me as State Historian. Our interview lasted nearly an hour, and we posed together for photos. Topher is a highly intelligent young man, and I'm pleased that the State Historian was able to assist him with his history project. I assumed that mayors Bruggeman and Smith would make remarks about the background of Texarkana. Instead, they took the podium together and read a joint proclamation describing the State Historian of Texas. The Office of State Historian was mentioned nine times in the joint proclamation, in conjunction with my program commemorating the anniversary of Texarkana's founding. Mayors Bruggeman and Smith finally announced that "we welcome Bill O'Neal, Texas's State Historian, to Texarkana and confer upon him honorary citizenship in Texarkana, U.S.A., and herby proclaim December 3, 2012, as BILL O'NEAL DAY." I was called to the speaker's stand and presented the proclamation. Then each mayor affixed the pin of his city upon my lapel. I was astounded and proud and deeply grateful. When Dr. Wilder introduced me as speaker a few moments later, he mentioned that he had been unaware that there was such a position as State Historian of Texas. That is a common impression - one that I am trying to change. The office of State Historian of Texas was created just seven years ago, and I am only the third historian to hold the title. I was informed from the beginning that a major goal of mine should be to make the Texas public aware that there is a State Historian. And so I speak wherever I am invited. I travel to museums and to other historical sites across Texas. I hand out State Historian business cards to everyone within reach. I appear as State Historian at schools from elementary to university campuses. I post my historical travels and adventures on this blog. Since my appointment I've given newspaper interviews, from the New York Times to the Panola Watchman. I was in radio, primarily as a sportscaster, for 36 years, and I readily participate in radio interviews as State Historian, includng last Monday in Texarkana. Indeed, the Texarkana College marquee announced to all passersby that the "Texas State Historian" would speak on campus at Texarkana's 139th birthday. My thanks to Texarkana for their most gracious hospitality - and for helping me spread the word about my position as ambassador for the incredibly rich history of Texas. During the Christmas season of 1897, eight-year-old Virginia O'Hanlon famously expressed concern about the existence of Santa Claus. Francis P. Church of the New York Sun, as part of his classic reply, reassured the little girl: "Yes, Virginia, there is a Santa Claus." With that settled, please allow me to add: "Yes, Texas, there is a State Historian."